LeMarchant was born in England in 1803. A descendant of the distinguished Guernsey family, he was educated at the Royal Military College, Sandhurst. He entered the British army at 17 and for the next 12 years purchased his way up the ranks. In all he spent £10,000 for commissions and became one of the youngest officers ever to command a British regiment. He served in Spain and the Cape Colony. In 1846, LeMarchant was unexpectedly offered the governorship of Newfoundland. He reluctantly accepted, thinking it would improve his prospects in the army, and arrived in St. John's in April 1847. With no prior experience in colonial administration, LeMarchant faced a difficult situation. Severe economic difficulties were compounded by potato blight and the impact of a hurricane the previous September. St. John's was being rebuilt after the great fire of June 1846, and there was much dissension surrounding the administration of relief funds. The new governor did little to ease the situation. Taking the view that far too much had been spent on direct relief, he diverted funds to public works, mainly in St. John's, including repairs to Government House. The relief controversy revived debate over the introduction of responsible government, to which LeMarchant was firmly opposed. The colony was not yet ready for the new system, he thought, and it would lead to undue Roman Catholic political influence. An unpopular governor, LeMarchant left Newfoundland in 1852, to become lieutenant-governor of Nova Scotia. 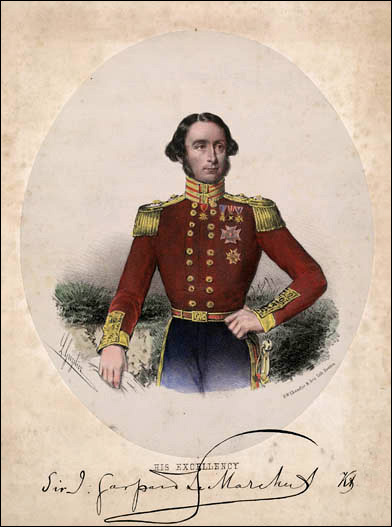 In 1859, he became governor of Malta, and from 1865 to 1868 he was in Madras. He died in London on February 6, 1874.